It was Paul’s birthday on Saturday! As per tradition, I wanted to make him a fabulous birthday dessert. Usually, he requests some kind of cake, as long as it has peanut butter and chocolate. Last year he changed it up with this cake, if you remember… this year we changed it up again! It’s not even cake! But it is an extremely luxurious pie. 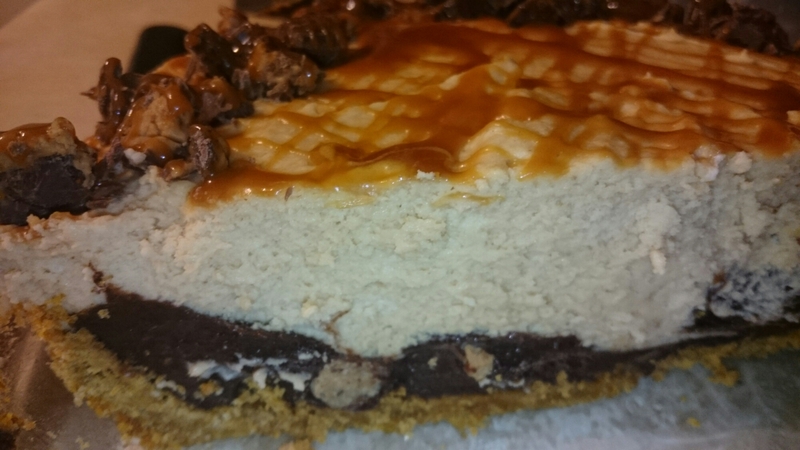 It has a graham cracker crust, a layer of silky chocolate ganache, then a peanut butter mousse over top of that. 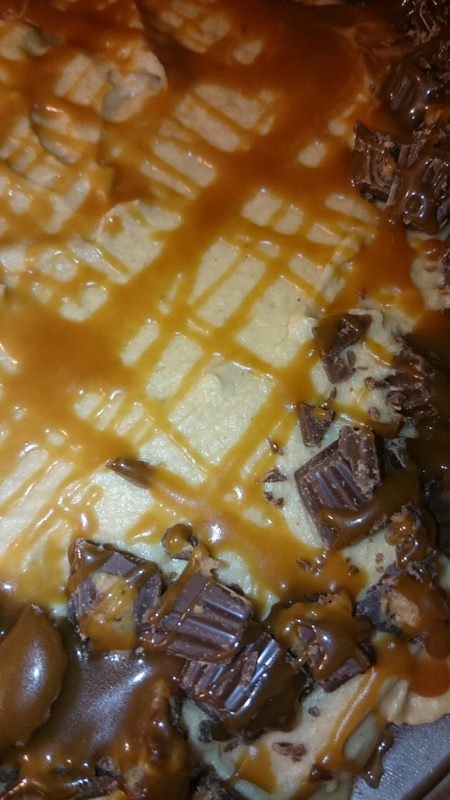 To finish it, I added chopped mini Reese’s peanut butter cups and homemade salted caramel was drizzled over the whole thing… So I definitely jazzed up the original version that I found. I may have also put mini Reese’s in between the layer of chocolate ganache and peanut butter mousse… because there’s no such thing as too much chocolate and peanut butter, right? All things considered, the pie is very simple to make. I made the crust first, because it has to bake and cool. While the crust was in the oven, I made the caramel sauce (which is the same caramel sauce used in my Salted Caramel Apple Pie Bars!) and let that cool, then made the chocolate layer, and while it was setting up, made the peanut butter mousse. Super easy! Let it set in the fridge for at least an hour, then BAM! 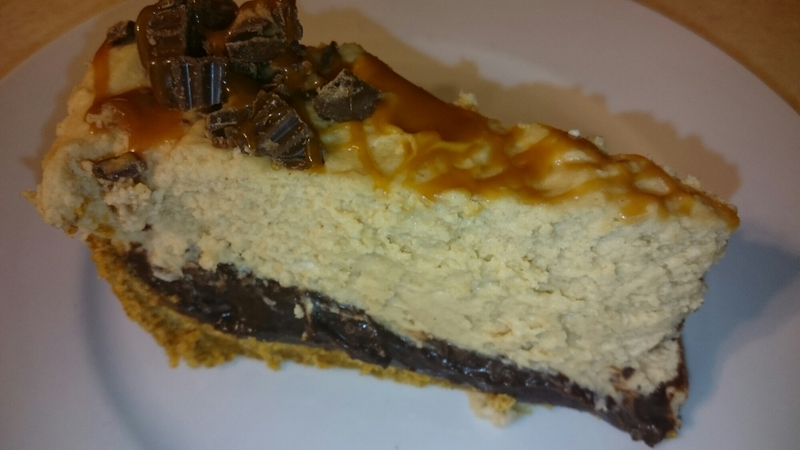 A decadent dessert that will please any dessert/peanut butter/chocolate/pie lover! * Not a mistake. The peanut butter mousse calls for cream two ways – the first measurement is to make a peanut butter ganache. The second measurement is whipped until thickened (but not whip cream), then folded into the peanut butter ganache. Preheat oven to 350°F. Spray a 9 inch pie plate with cooking spray. For the crust, in a medium bowl, combine the graham cracker crumbs, butter, and sugar. Mix to combine, then press into the pie plate. Bake for 15 minutes, until golden and set. Let cool. For the chocolate ganache, in a medium microwave safe bowl, place the chocolate chips, cream, corn syrup, and vanilla. Microwave for 30-40 seconds, until chocolate is melty. Whisk together to form a smooth ganache. Pour into the cooled crust, and freeze for 10-15 minutes. For the peanut butter mousse, in a large microwave safe bowl, place the peanut butter chips, cream, and vanilla. Microwave for 15-20 intervals, until peanut butter chips start to soften. Whisk together to form a smooth ganache. Set aside to cool. In the bowl of a mixer, place the 1 c. of cream and the sugar. Whip until cream is thickened, but not forming peaks yet (stop it just before whipped cream consistency). In three additions, add the thickened cream to the room-temperature peanut butter ganache, folding in gently with a spatula, not stirring or whisking in. With the last addition, the mousse should be light and fluffy. Spoon the mousse onto the cooled and set ganache. Garnish as/if desired (again, I used chopped mini Reese’s and homemade salted caramel), and chill for at least 1 hour, or overnight. Slice and serve. Time is flying right now! I have not been as good as I should in keeping up with trying to give you all a new post approximately every week or so. That’s how busy I’ve been. What with subbing so much, working at the restaurant, and planning this wedding, I feel like it’s an accomplishment to make myself dinner half the time! I do have a couple recipes “on deck” if you will – that I’ve made in the last little bit and haven’t posted yet… so because I didn’t get a sub call today (which is extremely strange to me!) I will probably spend the next little while in front of my computer and type out those posts/recipes, so that I can just click “Publish” and send you all more goodies! I pinned these biscuits a few days ago, because I just hadn’t had biscuits in the longest time. 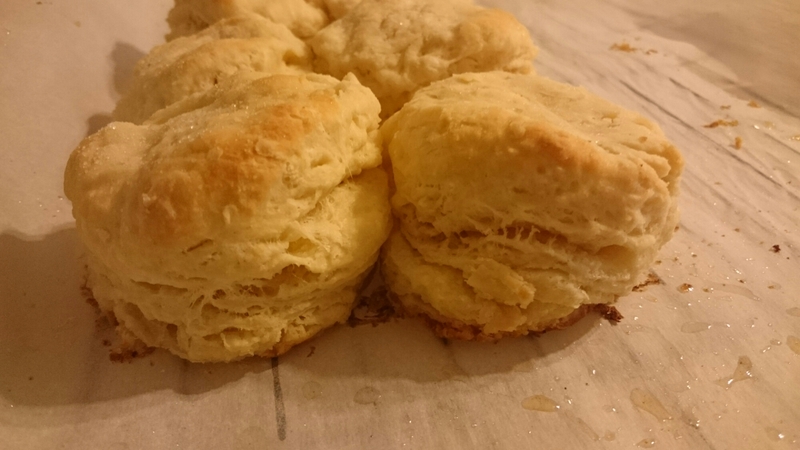 I love a fluffy, tall, flaky biscuit, and that’s what was advertised in the original recipe, so I decided to give these a go (and make myself something delicious to snack on as well!). I love buttered biscuits. I know, some people prefer jam, some peanut butter, and the U.S.A. prefers biscuits topped with a white sausage gravy, but I am a sucker for a plain, beautiful biscuit slathered in butter while warm. The butter gets all melty and delicious, and the biscuit layers… I’ll stop. I’m too excited. The recipe is extremely easy – you don’t even need to drag out your mixer! They took me about 10-15 minutes to whip up, and they bake for as long, so you can have warm, fresh, fluffy biscuits in the next half hour. You’re welcome. Preheat the oven to 425°F. Line a baking tray with parchment paper or a silicone baking mat. In a large bowl, combine the flour, sugar, salt, and baking powder. Toss with a fork to combine. Make a well in the dry ingredients, and add the buttermilk, beaten egg, shortening, and water. Mix with a wooden spoon to start to combine, but do not overmix. Add in cubed butter, and with your hands, knead the butter into the dough about 7 or 8 times. The butter should be slightly incorporated, but also in visible chunks in the dough. This will make the biscuits extra fluffy. Again, do not overmix, or the biscuits will become tough. Turn out the dough on a non-stick surface or wooden cutting board and pat dough into a circle, about 1½ inches high. Using a glass rimmed in flour or a circular cookie cutter, cut out biscuits, getting as many from the first cut as you can. Do not twist the cutter or the glass, instead going as smoothly up and down as you can. Twisting the cutter’s edge seals off the edge of the biscuit and does not let it rise as high. Place biscuits on lined baking sheet, with the edges touching. 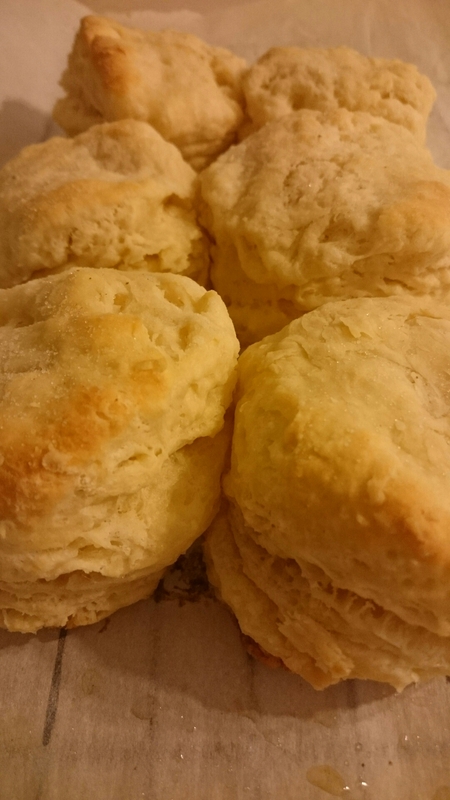 Bake in preheated oven for 12-15 minutes, or until biscuits are light golden brown around tops and bottoms. Serve warm with butter, jam, gravy, whatever your heart desires! I love marshmallows! I have been tossing around a bunch of new recipes to make, and finally, Paul and I went to the grocery store on Friday. 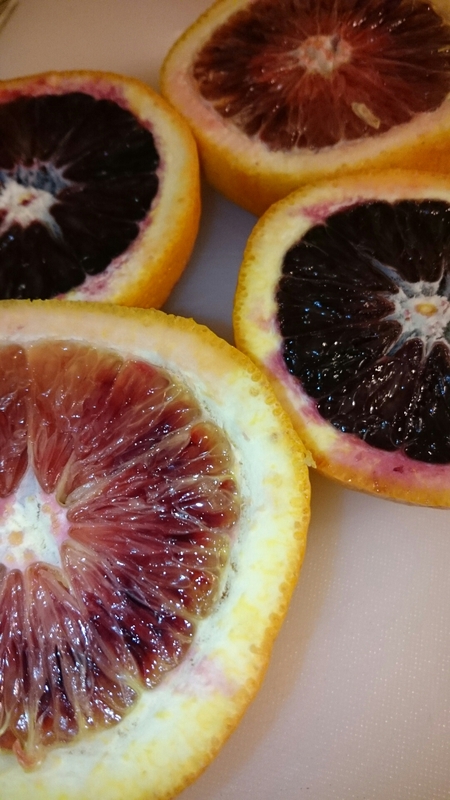 There were a bunch of fresh blood oranges there, and I got extremely excited, because I had always heard about blood oranges, but I had never eaten/seen one/baked with one before. This has all changed now! These marshmallows turned out so well. 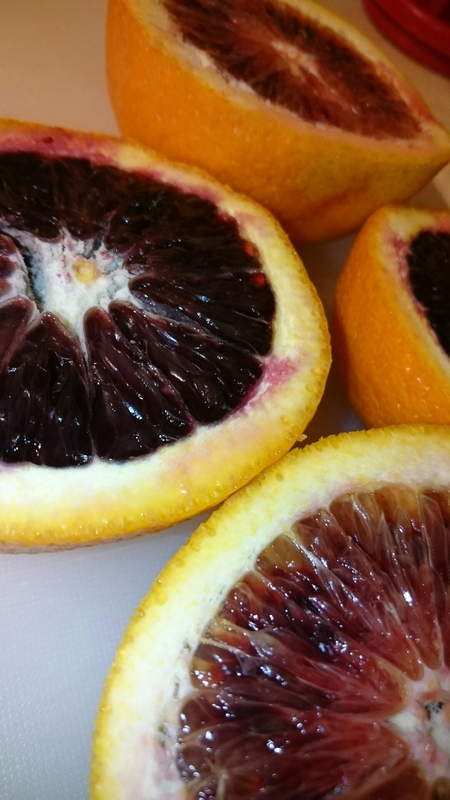 I found some great big blood oranges, and I was so excited when I cut them open. Some of them were a bit lighter, and some of them were so dark they looked a blackish-purple when I cut them open. 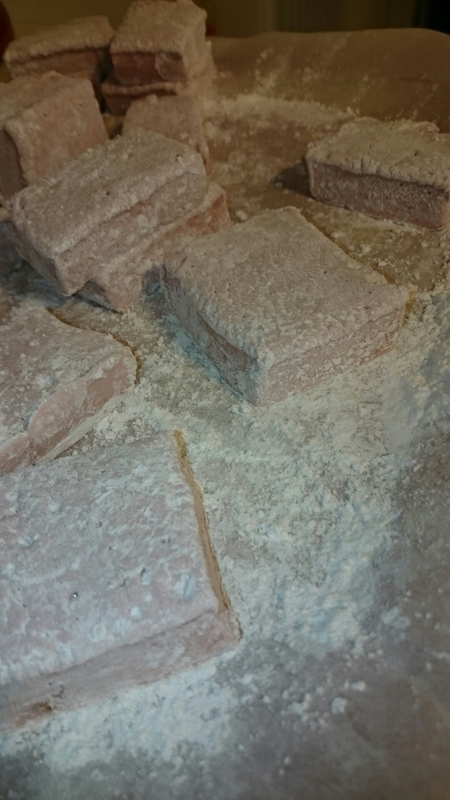 They turned out a beautiful light purple colour when I finally got to cut the marshmallows. Try these beauties! Blood orange marshmallows… Genius! Combine icing sugar and cornstarch, and set aside. Line a square pan with parchment paper, and cover with the icing sugar and cornstarch mixture. Set aside. Zest one of the oranges, and set aside. Juice the oranges, and strain out any pulp. Place ½ c. of the orange juice into the bowl of a mixer with the gelatin. Leave gelatin to soften while making the sugar syrup. In a deep saucepan with a candy thermometer attached, combine the rest of the orange juice, sugar, corn syrup, salt, and vanilla. Heat over medium-high heat until the mixture reaches 240ºF. Once the mixture reaches this temperature, turn on the mixer to low, and drizzle the sugar syrup down the side of the mixer. Whip on high for 5-10 minutes, until mixture cools and looks milky in colour (like melted marshmallows). Pour marshmallow mixture into the lined pan. 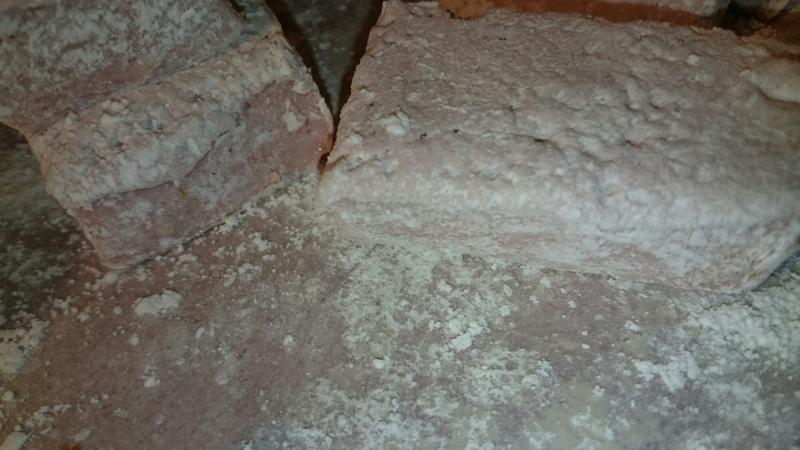 Top with a thin layer of the icing sugar/cornstarch mix, and let set at least 8 hours or overnight. Once set, turn out onto a cutting board, and cut into squares. Cover all the cut edges with the icing sugar/cornstarch mixture, and store in an airtight container.